Rumpled Yharnam Hat is a Head Armor/Attire in Bloodborne. It is part of the Shabby Set. Well-worn and losing it's shape." Located with the Sweaty Clothes on a body in the streets of Old Yharnam. Accessed by descending the tower of the Healing Church Workshop, passed the entrance to the Abandoned Old Workshop. 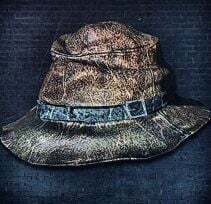 Tied with the Bone Ash hat for highest fire defense.